Summary (from Goodreads): Three teens, three stories—all interconnected through their parents’ family relationships. As the adults pull away, caught up in their own dilemmas, the lives of the teens begin to tilt…. Mikayla, almost eighteen, is over-the-top in love with Dylan, who loves her back jealously. But what happens to that love when Mikayla gets pregnant the summer before their senior year—and decides to keep the baby? Shane turns sixteen that same summer and falls hard in love with his first boyfriend, Alex, who happens to be HIV positive. Shane has lived for four years with his little sister’s impending death. Can he accept Alex’s love, knowing that his life, too, will be shortened? Harley is fourteen—a good girl searching for new experiences, especially love from an older boy. She never expects to hurdle toward self-destructive extremes in order to define who she is and who she wants to be. Love, in all its forms, has crucial consequences in this standalone novel. My Summary: The lives of three teens are turned upside-down by love. Shane is openly gay and falling in love with his boyfriend Alex - who happens to be HIV positive. Mikayla is head over heels in love with her boyfriend Dylan, but the intense love between them may not be enough to keep him around when she gets pregnant. And Harley is just beginning her life as a teenager - she's 14, naive, and eager to please. All three will experience the ups and downs of love ... but will they be worse off for it? My Thoughts: Yet another awesome read from Ellen Hopkins! I swear, one of these days I'm going to pick up every single one of her books from the bookstore and take a week off to read. I loved Tilt. It wasn't as heavy as Impulse, but it was still on the edgy side of contemporary lit - exactly what I like to read. The situations Hopkins' characters experience are realistic, and their reactions are genuine. My favourite was probably Shane - if there was ever a character I wanted to hug, it's him. As usual, Hopkins weaves an amazing story through prose. 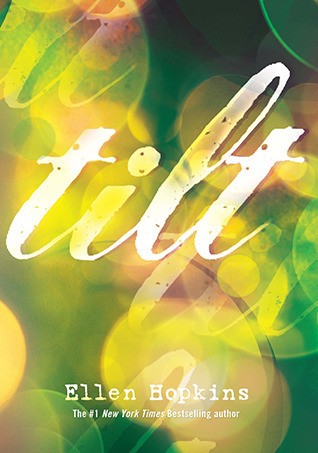 I had no idea Tilt was a companion novel to Triangles (they can be read as stand-alones, don't fret!). I love that the author is able to give both sides of the story, and you can bet I'm going to be reading Triangles soon! Final Thoughts: I recommend this to anyone who is a fan of Ellen Hopkins and contemporary lit. It's a great book for those wanting to sample Hopkins' work - I guarantee you'll be hooked after you finish.